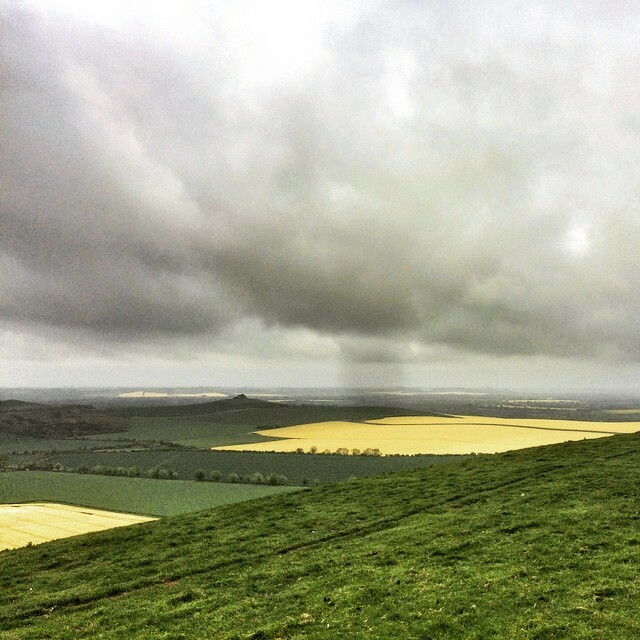 We’re on holiday in the UK at the moment, down in Oxfordshire so I looked around for a race nearby and found one – the 33 mile Marlborough Downs Challenge. The Marlborough Downs Challenge started in 2003, and comprises of a 33 mile ‘ultra’ route and a shorter 20 miler course – they both take on much of the same terrain, which is in and around the Marlborough Downs of Wiltshire, rolling, undulating hills of chalky clay, iron age relics, white horses etched into hillsides and old Roman roads. The MDC is now part of the Runfurther Ultra Championship series so attracted a fairly large field of runners. As a ‘short’ ultra-marathon it’s a perfect introduction for people who haven’t ran more than 26 miles before, and although it was hilly there was nothing in the profile to worry anyone since I would call it ‘punchy’ rather than steep. With an emphasis on self-navigation, the race organisers only lightly signposted the route, in just a few places near the beginning and couple of other areas. However runners were supplied with turn by turn route directions and downloadable GPX track and were expected to find their own way over the course. It didn’t help then, that after having spent ages plotting the route online over an OS map, printing out and laminating a roadbook, I then proceeded to leave all of this at home! I still had the route directions however and decided that there would be safety in numbers on enough of the route to be able to find my way around the course. The race started off fairly gently – all my races this year have been 10-20km, and so are usually off at lightning pace with lots of shoulder barging, but this was much more serene bearing in mind even the winner would be on their feet for the next 4 hours. After 3 or 4kms I found myself dropping back from the lead group of about 6, into a smaller group with two other runners – we were 200m behind the leaders and maybe the same ahead of middle pack behind. 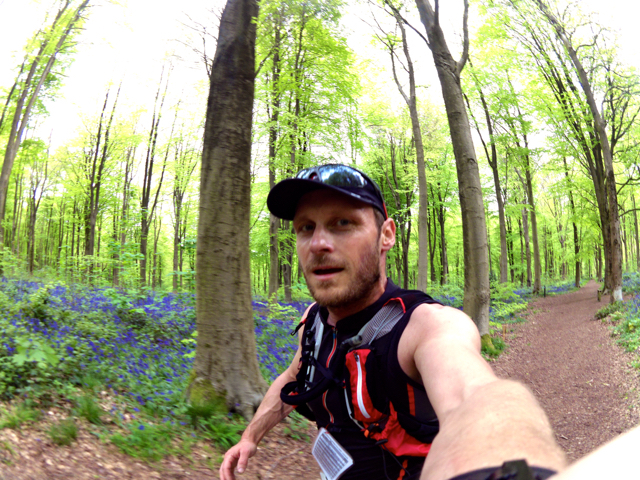 After 5km we entered West Woods, which this time of year was full of bluebells and was looking pretty scenic – I even managed to grab a few pictures as the terrain was good (if boggy in places) and I was really getting into a good rhythm. Suddenly we exited the woods and one of my companions looked into the distance down the valley where we expected to see the lead pack to see nobody. Looking at our maps and directions we realised we had overshot a turning and ran almost a mile in the wrong direction. Once we had finally backtracked to the correct (unmarked) turn, we rejoined main group at the back of the field. By this point the trail narrowed and overtaking was difficult in the boggy ground as we ran through glades of pungent wild garlic. I started to pick my way through the field but resigned myself to the reality that I wouldn’t be placing highly, even with over a marathon of distance still to run I’d lost at least 20 minutes on the lead group. The trail opened up from forest to rolling downs which made overtaking easier, and also navigation because it was possible to see a couple of miles ahead and see the rest of the race snaking their way across the countryside. 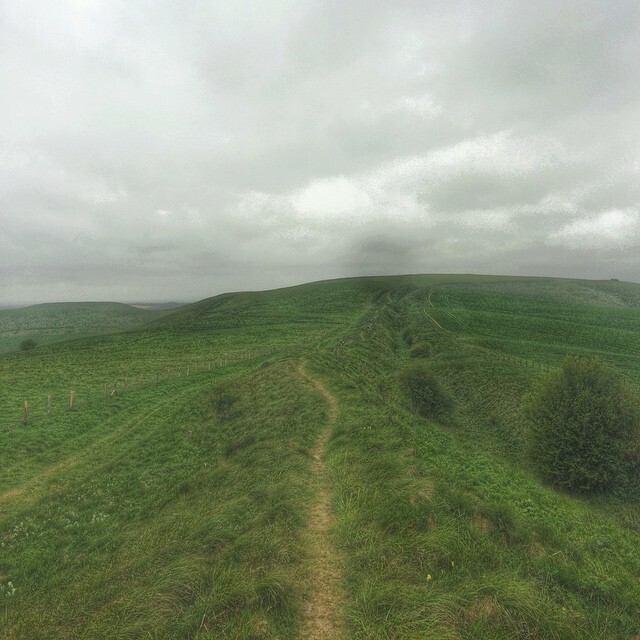 The trail opened up into open countryside as we climbed higher up onto the downs. The weather continued to be overcast and windy, and a light drizzle blew in across the hills but it never rained, meaning it was pretty ideal for running and getting dehydrated was not going to be a problem. 9 or 10 miles into the route, the course split off to the north for the 20 mile runners, where the rest of us continued west. We would rejoin the 20 mile course in another 17 miles or so. After descending off the downs, we ran into the small town of Bishops Canning where we had a few other navigational changes, and I teamed up with a runner who had done the course a few times to negotiate the changed route for this year. 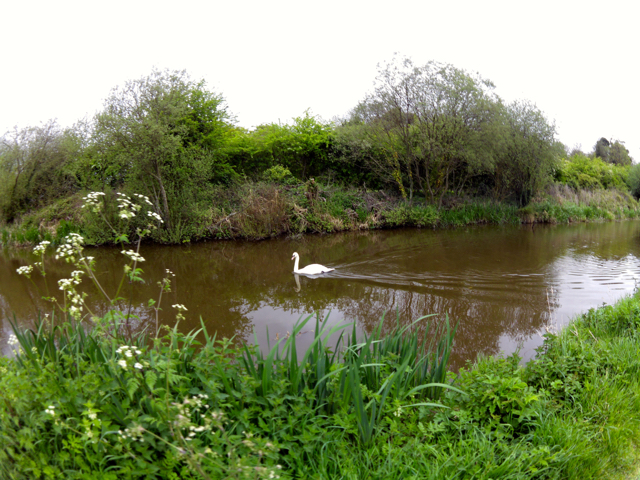 We eventually found our way onto the canal towpath, where a long stretch flat track continued into the market town of Devizes where I counted bridges until reaching the next checkpoint. After leaving Devizes, the route climbed some fairly steep hills, climbing up towards distant radio antennae that seemed to take forever to reach. 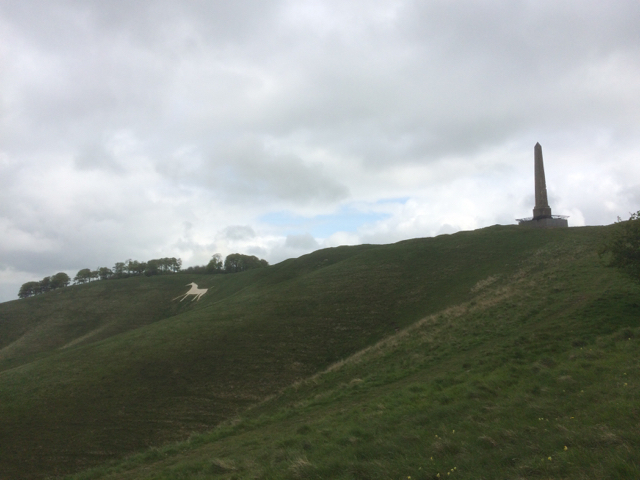 More undualting terrain and we then arrived at the Cherhill White Horse, and Lansdowne Obelisk. By this point though, I’d already run a marathon distance so wasn’t really interested in admiring the scenery (besides, there are loads of white horses in the hillsides in this part of the world, and this one was only cut in 1780, as opposed to the bronze age carving at Uffington White Horse that I’m much more familiar with) and so continued to press on to the Beckhampton checkpoint where the 20 mile route rejoined our route. Running through Avebury, I caught a glimpse of the stone circle. There was lots of support with people cheering and clapping in the town (a nice pub on the road and lack of rain probably helped) despite a little girl asking me why everyone was clapping. The final run in to Marlborough was fairly uneventful, and I clocked my finish time at 5 hours 51 minutes, so considering the extra mileage (36 miles in total – 58km) I was pleased to get under 6 hours. 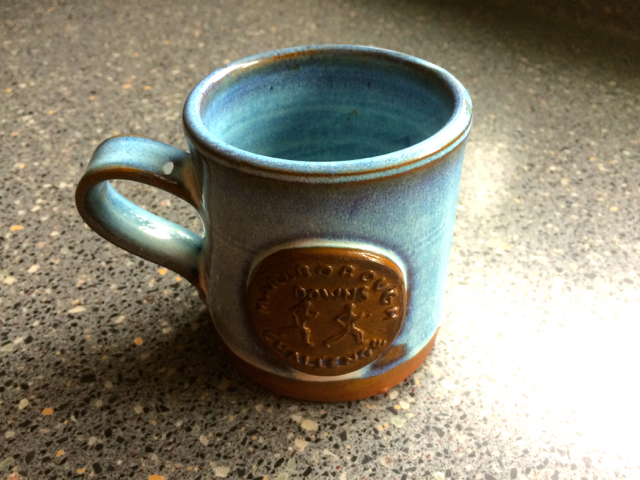 All finishers were awarded with a hand made mug from the local pottery. Overall I enjoyed the day – it was good to get out and do fairly long run on terrain that wasn’t too technical so wouldn’t wipe me out for days to come. The checkpoints and food stops where well run, and the marshall generally fairly encouraging. There were shower facilities at the finish (in the local leisure centre) and a meal for all finishers although I headed home quickly. My only criticism, and one of a lot of people on the course was the lack of course markings. I realise that it was made clear in advance, and in fairness the directions where pretty accurate. 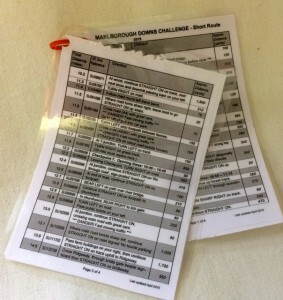 However I think it detracts from the enjoyment to have your head stuck in a route book, following it each few hundred yards like an in-car sat nav – I much prefer to be able to take in the scenery, chat with other runners and generally enjoy the event without worrying too much about taking a wrong turn. However, that said, I knew what I was getting myself into as did everybody else – and getting lost was my fault, and finding my way back was my responsibility. 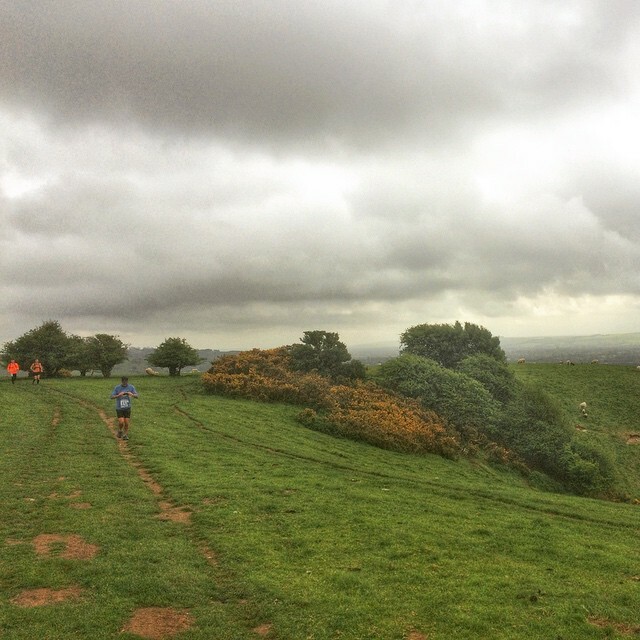 I would recommend the event to anyone who hasn’t yet done an ultra but wants to step up from marathon distance – its good intermediate step before plunging into 50 milers.